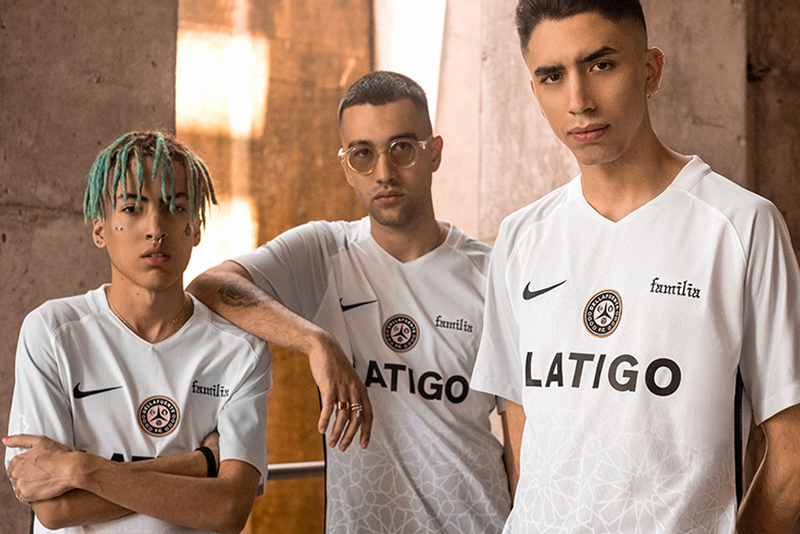 Once again blending the worlds of sport and music into fashion, sportswear giant Nike has joined forces with hip-hop artist Dellafuente and Spanish brand LA TI GO on a football kit. The top, crafted from Nike’s Dri-FIT technology, features a fading grey to white geographic pattern inspired by the artwork found in La Alhambra located in Granada, Andalusia, Spain. The piece also includes a LATIGO motif on the front, Nike Swoosh on the right chest, and “Familia” on the left chest. Dellafuente F.C.’s badge containing the Islamic moon and the Jewish star of David — incorporating the values, unison and culture of the club — is also featured front and centered. Interested buyers can look for the LA TI GO x Nike Dellafuente FC jerseys to hit Nike.com/Jerseyshop and dellafuentefc.com simultaneously on Saturday, May 19 at 9:00 a.m EST.